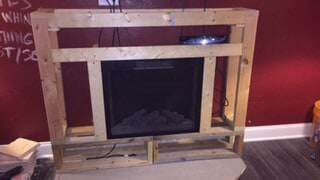 After getting sick of looking at my electric fireplace and mantle that came with the house, I decided one day just to take it apart. Once I took out the tile, the drywall, and all the framing, I was in for a surprise. 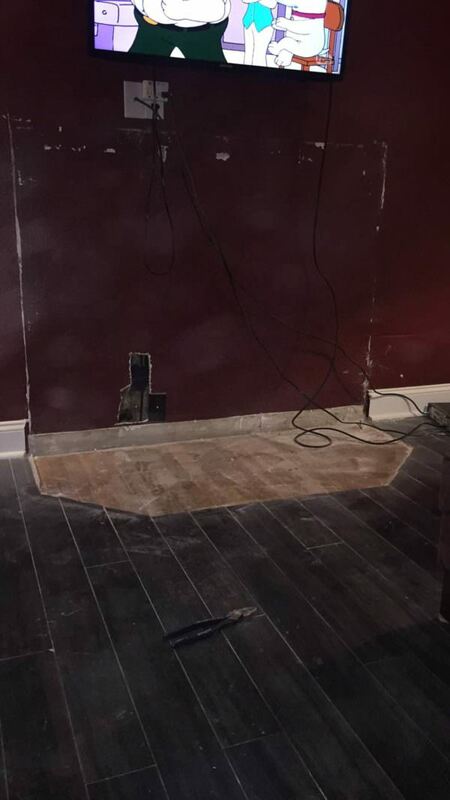 I realized that there was hardwood flooring underneath that I needed to cover back up. I love the look of pallets, and I knew I wanted to rebuild with them. However, I wanted to include the wall behind the fireplace. Luckily I live in an area of Pittsburgh where there's a great store in town that puts out free pallets when they don't need them anymore. I took many trips there and got as many as I could. 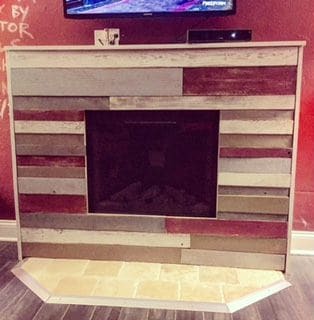 I built this Pallet Living Room Wall/Fireplace Surround them! First, I built the frame back up out of 2x4's and 1x3's (most of them were taken from my rebuilt fence and reclaimed). The frame itself is about six ft wide, 1.5 ft deep, and almost five ft tall. I framed it around the already-existing electric fireplace that came with the house. After I installed that and made sure, it was secure. I put down a layer of cement board on the floor to cover the exposed flooring. From there, I began cutting pallets and random lumber I had to lay on the front of the fireplace. I sanded each piece, keeping the rough look, getting the dirt and first layer off. I then spread one coat of paint on each one, waited for it to dry, and sanded it one more time. It was important to me to not "overdo" it. Without a doubt, I wanted to keep the natural-pallet-wood-look. I used a nail gun to attach each piece to the frame. I kept the existing mantle, painted it white and sanded it. Additionally, I had a longboard in my basement that I cut in half and used for the sides of the fireplace frame - it fit perfectly. Before I got to the pallet wall, I laid my marble tile (it was donated to me for free!) and proceeded to do my first tiling job. I cut the pieces with a grinder and used a piece of aluminum for the trim to match the pallet's industrial look. The wall was tough - lots of cutting, lots of swearing. I used a reciprocating saw to cut every piece of the pallet frame. Then I used 0a standard table saw to cut the individuals pieces to fit. I sanded each piece individually, getting rid of dirt and another residue. It was important to me to keep the natural look of each piece. I attached each pallet with a nail gun. The wall across is about 13 ft and about nine ft high. I plan on hanging things on the wall, but for now, I'm just going to sit and enjoy the way the Christmas tree looks in front of it. Liked this post? 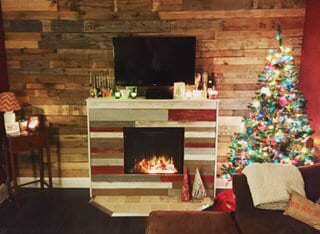 Check out this best-of pallet walls article for even more inspiration!